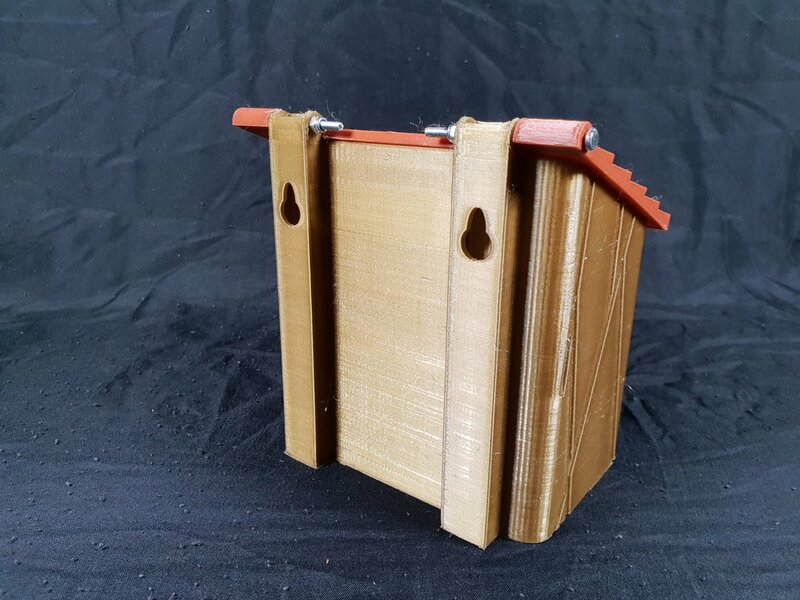 This is a 3D printed birdhouse designed to fit a Rapsberry Pi Camera along with a raspberry pi and a powerbank. it has two pieces, a large housing unit with a wood effect design on it and the hinged roof with a weather-proof design. The unit is 120mm wide, 85mm deep and 130mm tall. The lid is 135mm wide, 100mm deep and 8mm tall. This can be used as a timelapse camera, wireless CCTV camera or even a motion camera for taking pictures of nature. Parts & instructions for the my naturewatch camera (as seen on Springwatch) can be found here. Print off the main unit and lid parts. Ideally print them in different colours, I used red or grey for the lid and brown or gold for the unit. Attach the lid using M3 x 40mm bolts and use M3 locking nuts to ensure the nuts don't come loose. Close the lid and attach the unit to the wall using the screw hooks. There is no electronics, just connect the Raspberry Pi to power (battery or USB) and connect the camera. Follow the guide on Naturewatch Camera Instructions for help with programming.